Apology letter for resignation without notice. Resignation letter with deep regret. It is with regret that i tender my resignation. I am writing to you because I would like to formally apologise to you for my resignation letter. Last month I submitted my resignation letter because I wanted to leave the job. However after a month off work I have come to realize that I don’t want to leave work because I forgot how much I really enjoy the work. I forgot the reason why I was doing this and I lost my passion and my drive to continue. Over the last month I have had a lot of time to myself and I have been doing some activities that have reminded me of why I was doing this in the first place and I feel that I have that drive and my passion back again. If it is possible I would like to take that away and forget about it. I would like to continue to work here with all of my friends and work mates. I hope that you will give me a second chance and I look forward to hearing back from you. I’m writing this letter to you so that I can apologize, that I resigned from the post of floor manager last Saturday. I know floor manager is so much important and without any reason I gave you the resignation. I want to continue my job, please accept my apology and give me my post back. I’ll be so much thankful to you. Sample letter to employer requesting the end of contract. Termination letter to employer. Termination of employment contract by employee. 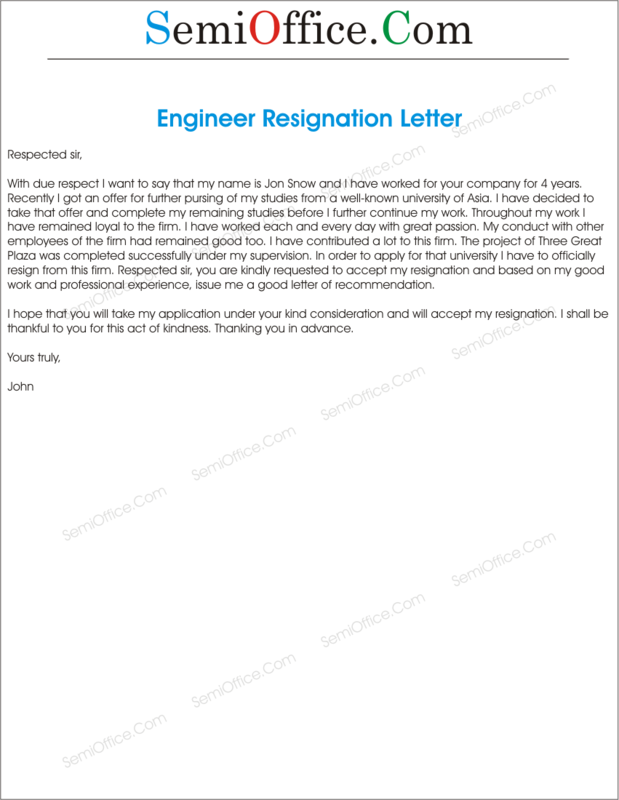 Employee termination letter without cause. Termination of employment letter by employee. I am writing to you because I would like to discuss my contract. I have been in this job for many years now and I used to believe that this job was a good thing for other people to help them in court when they are wrongfully convicted. As a lawyer firm we are supposed to stand by our clients even when we know that they are criminals. However in the last year I have been working here I have seen this firm put away innocent people in prison. I have seen too many people defended and got away with murder and too many innocent people convicted. So because of this I would like to end my work contract I will work my one week notice then I’m out of here. Thank you for all that years I have saved people and all that I have learned. This is to notify that I have been working with your esteemed organization as a Logistics Coordinator since last two years. My employment contract is going to end in the last week of the current month. Please be informed that I would like to terminate my services as the contract ends. This is due to some personal reasons and I’m completely satisfied that the task assigned to me were fulfilled on time and there is not a single NCR (Non Conformance Report) against me. Kindly process my end of service benefits at the earliest and release them along with the current month salary. I would like to thank all the colleagues who supported me throughout my career. Appreciate if you could also provide me the experience certificate on the last day (——————)of my employment with the company. Resign Letter As Well As Complaints for Colleagues Who Were not Supportive. I never thought a day would come that I would have to write this letter to you but alas you don’t always get what you want. It’s just a hard reality of the world. A few weeks back my wife was very ill and had to be treated immediately. As you know I am shift worker I had to make sure that my shifts were covered somehow, unable to cover my shifts I would’ve had my salary deducted. I went to a few colleagues and begged to them to cover my shifts, I even promised them that I would cover their shifts along with some extra time as soon as I get back to work, but to my disappointment no one helped me. I had to come to the office for my shifts. Since my wife and I live alone there was no one to take care of her, which stressed me both emotionally and physically. By the grace of God, my wife is fine now and is recovering but I can never forget the fact that no one helped me in my time of need and acted selfish. I don’t think I can work anymore in such an unsupported and mean environment. Therefore, I would like to resign from the office effective immediately. I hope you and your firm keeps growing with or without me. Attached is my complete resignation letter. Please be informed that I am resigning from the post of manager of finance of ABC organization with effect from 7-10-20XX, 30 days from today. Please consider this as the 30 days’ notice of resignation as is mandatory per my contract. You may be aware that in spite of my repeated applications for promotion to the post of manager. I was not considered, and I was passed over twice and people with much less experience were promoted instead. This is highly frustrating and I feel cheated. With the over 6 years of experience, I am more than a qualified for the post. I am therefore left with no option but to tender my resignation. I am sure you appreciate my stand and will relieve me of my responsibilities on 7-10-20XX, my last working day that your organization, I trust that my dues will be paid before that day. Sample Letter for Quitting a Job Example due to poor and insufficient salary package from the employer or company. I am writing to you because I would like to give you my official letter of resignation. I have been working with this company for three years and I have been at different branches all over the world. However I can say that I have not been to a more disorganized branch than this one. My job requires that I travel from branch to branch and hand in my report but over the last six months the one constant problem has become a big headache for me and my family. Salary is something that is fixed each month and in the last six months my salary has been lower and lower due to the company deducting without any reason and even my daily wages that I get for my labor supply. I have sent various letters of complaint and I have even talked to the head of this company in person about this and nothing has been done. It is for this reason that I am resigning this mess has cause me a lot of stress as I also have bills to pay and a family that rely on me to provide for them. I hope that you sort this out for your future employees and I wish you all the best in the future. The reason for my writing to you is that I am quitting the job the company has provided me with, the reason behind quitting being the lesser salary offered. I am able to find a better job. Most respectfully, I want to say that I am facing problems at work, the main problem being the low salary. I am unable to afford my basics and secondly, other employers are paying a much handsome salary for the particular job I am performing at your company. Therefore, I have decided to quit the job. I can no longer remain in the financial crises being faced right now. Please accept my resignation and consider this application as formal resignation I am sending you. With all due respect it is stated that I have been a part of your business from last 3 years, and my performance is up to the mark. I have always been a pro and punctual employee and have given my best but I feel that the salary I am receiving for the job is much more less as compared to the performance. I would like to serve an organization which will respect my talent and efforts and would pay me what I deserve. Sir, I am resigning from this job as I am looking for a better opportunity. I would appreciate if you clear my payment for this month. Thanks. It is humbly submitted that I am working in your esteemed organization as Manager I.T for the last ten years. I have had a good time with you for many years but now I am getting some salary issues for the last three months due to which it is regretted to inform you that I am unable to continue my services with your esteemed organization in such scenario. I have also not been rewarded annual increment this year which is due since last December due which I am facing many financial issues and I am unable to fulfill even basic needs at home. I, therefore, hereby resign from my services and request your kind honor to accept it so that I can try for my job in some other organization. I assure you that I will complete all my pending assignments before leaving and also train the other person who will come to look after my duties. I hope you will accept my resignation due to above mentioned reasons. It is with regret that I tender my resignation from the post of store in-charge at seven star logistics on account of insufficient salary. As you know, I have been working efficiently for one year in the company and my working performance is admired by all senior officers and colleagues. My services are also acknowledged by the director general as well. I am sorry to inform you that salary which the company is offering me is insufficient as compared to the expenses of a middle classed person. Irony is that no increment is added in this salary since my date of appointment. Having seen the static growth in terms of earning, I have been desperate and forlorn. You are requested to accept my resignation by virtue of insufficient salary and give clearance at your earliest. With effective from today, I am resigning from this company because of insufficient salary package. I have been struggling with my personal financial life. It is becoming very hard for me to make the ends meet with the package given. I have a family member to take care of as well as my own needs. With my current salary I can’t even fulfill my everyday needs properly. I had been requesting my boss to give me a raise but there was no luck there. So, I am leaving this job to find a better one which can offer me just enough to increase my standard of life. I hope you are good in health. I am writing this letter to you so that I can inform you about my problem. First of all I am very thankful to you that you provided me the job when I need it the most, you helped me a lot in every possible way, but the thing is that the work you gave me, is so much difficult and hard that the salary according to that is very less. As my shift starts from 8 am and continues till 9 pm and all I have to do is continues work with 15 minutes of lunch break. I think I am giving my hundred percent to you but all issue is about my pay. So after so many requests from HR and company I am resigning from the post of manager today. 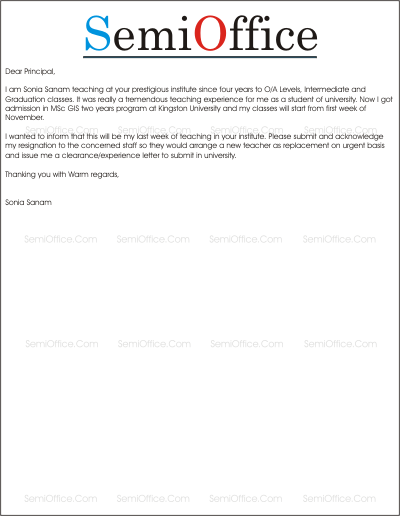 Sample resignation Letter because of higher studies. Letter from a employee requesting him to accept his resignation and issue an experience and recommendation letter so that he/she may complete his/her studies. It is submitted that I have been working under your kind supervision for ten years as a Fire Rescuer in London Fire Service. During my working time period I have learnt a lot and spent good time with colleagues. As you have best knowledge among us, the present time in which there is competition everywhere you cannot survive and get progress in the absence of good qualification. Being a part of this era, I will have to enhance my qualification by completing Masters Degree in the filed which fascinates me. In this regard, I have a golden opportunity in my hands nowadays i.e. scholarship in MONASH University Australia. Therefore, I tender my resignation to you and hope for its acceptance with the provision of experience certificate so that I could get another job after completing further studies. This is a resignation letter for termination of the job. It was a very good experience working in your organization. The reason of resignation is that I had applied to study law from a university abroad which had been approved. I have no grievances with any other employee or the management. I would be grateful if you could provide a permission to state your companies name in the references. My name is Harvey Spector and I am a junior teacher in your school. Sir I recently applied for master’s in home economics abroad in an international university. I am very glad to inform you that they accepted my application and they have invited me to come to university for regular classes from the start of next month. Keeping in view my above mentioned reason sir you are requested to accept my resignation letter. You are also requested to issue me a recommendation letter so that I may apply for job again after completion of my degree. Keeping in view the above mentioned circumstances i hope that you will accept my resignation and issue me a good letter of recommendation along with an experience letter. I will be thankful to you for this favor. Thanking you in advance. I want to say that I have always wanted to go for further studies and now when I am given a chance, then I seriously want to avail this opportunity. But I will not be able to continue my job due to my being busy in the studies. So, I want to resign from the job I am doing at your company. Please accept my resignation. I am writing this letter to inform you about my resignation from this a bank as a Relationship Officer. Kindly consider my letter also as a final pre- resignation notice to resign from the bank. The reason for this resignation is higher studies. I also request you to issue my experience letter at the end of this notice month so that I get clearance from bank to make my journey abroad to concerned university. I respect and regard Axim Bank as my mother institution, where I learnt a lot and acquired professional skills and career growth. This is to inform you that I have been working with your prestigious organization since three years as a Quality Control Supervisor. However, I have decided to enhance my skills by getting a professional degree in the same discipline for which I had applied and have been selected for the program which is to start in the coming month. As part of the agreement I will be serving the one month notice period where my last working day with the company will be 25th of January. I would to thank my all colleagues and the management for providing me the opportunity to work in a healthy environment where I learnt a lot by working with the professional team. Kindly settle my EOS dues accordingly and I would like to receive the job experience letter along with the dues. This is Aysha Yasir, a waiter of your hotel. I have been working in your organization for a month now and I really feel proud to be a part. I recently have got a great opportunity to continue my studies and one of my uncles are paying me for my college and further studies. Opportunity knocks once, I want to avail this knock and go for it. Your positive response in this regard will motivate me for doing my studies. It is hard for me to resign but I have to, for my future. 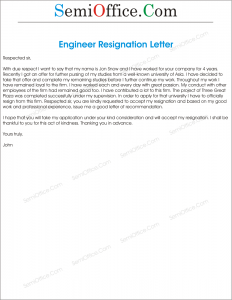 A letter from employee to the company manager, requesting him to accept his resignation on fair terms so that he may continue his further studies. This letter is to resign from my job of machine supervisor. Due to change in the residence I am facing difficulties in coming to work every morning. Even having a motor bike it takes me two hours to come to the workplace and the same time to get back to home. This is also affecting my health and my budget. So I have searched a new job for me near my residence in order to save my time, money and health. There is no other reason for leaving this job. I had a very good time serving in your organization. It would be great if my remaining salary and other payments to which I have right are been made available until next month. With due respect I want to say that my name is Jon Snow and I have worked for your company for 4 years. Recently I got an offer for further pursing of my studies from a well-known university of Asia. I have decided to take that offer and complete my remaining studies before I further continue my work. Throughout my work I have remained loyal to the firm. I have worked each and every day with great passion. My conduct with other employees of the firm had remained good too. I have contributed a lot to this firm. The project of Three Great Plaza was completed successfully under my supervision. In order to apply for that university I have to officially resign from this firm. Respected sir, you are kindly requested to accept my resignation and based on my good work and professional experience, issue me a good letter of recommendation. I hope that you will take my application under your kind consideration and will accept my resignation. I shall be thankful to you for this act of kindness. Thanking you in advance. 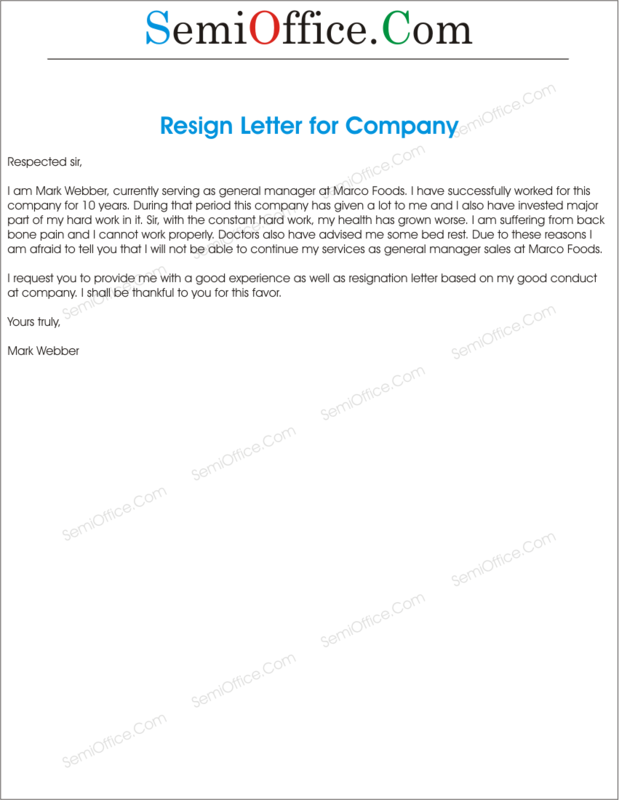 Sample resignation letter to a company from the employees, staff members, contract employees when they want to resign from this post. With all due respect I am informing you that there is some family issue in Pakistan and they are expecting me there as soon as possible and for this I have to resign from your company as I am permanently shifting to Pakistan. It was a great time which I spent with you and I was honored to be a part of your company but family is my priority and I have to go there. I would like to request you to clear all my payments and outstanding amount by the end of this month as I have reserved my tickets. A quick response will be appreciated. Thanks. Most respectfully, it is stated that I have secured a new job signing up from tomorrow at a hospital nearby my residence. So, I resign from this company from the post of Lab Assistant as I shall not be able to continue this job any further. I really enjoyed working here and learnt a lot during my working tenure. I shall handover all the deliverables next Monday at the HQ. Kindly approve my resignation letter so that I may get clearance from this company. I shall be very thankful to you for this act of kindness. I am Mark Webber, currently serving as general manager at Marco Foods. I have successfully worked for this company for 10 years. During that period this company has given a lot to me and I also have invested major part of my hard work in it. Sir, with the constant hard work, my health has grown worse. I am suffering from back bone pain and I cannot work properly. Doctors also have advised me some bed rest. Due to these reasons I am afraid to tell you that I will not be able to continue my services as general manager sales at Marco Foods. 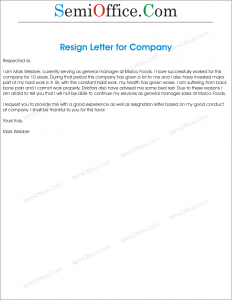 I request you to provide me with a good experience as well as resignation letter based on my good conduct at company. I shall be thankful to you for this favor. Most respectfully, it is stated that I have been offered a very good job at Royal Solutions DHA. This place is close to my residence and offers many facilities along with a handsome pay package. I have had a wonderful learning experience with all the colleagues and staff members at Tech Solutions and would definitely stay in touch. For my personal & professional growth, I request you to kindly accept my resignation letter and remit the notification period so that I can avail this new job opportunity as soon as possible. Thank you. It is intimated that I am serving in your company for the last three years. As a matter of fact it has really been one the best experiences of my professional career. I personally tried my best to give utmost out of my abilities. Now my visa to go abroad has been received about 10 days ago which I applied few months ago. My elder brother is already doing his own business overseas and wants me to join him there. In this context I hereby submit my resignation with favorable so that I can complete the required formalities to leave for abroad. An early action is requested please. It is with regret that I tender my resignation from the job of IT Assistant in your company on account of your harsh attitude and misbehaving in front of entire staff. I had apprised you that the mismanagement regarding the transferring of employee salaries was not found from my end but other senior members of the office were involved in this case but you turned a blind eye on my request. In spite of my good career in this company for a long time, you did not care of my seniority. This gives me pain to leave this office in this way because I have learnt many things here and it was a source of good earning for me and my family. I shall advise you to be polite with your employee and see the things from their place and angle. Anyhow, I will not take the resignation back and wish this company a best of luck. This is to notify that I have been working with your prestigious organization since December____. I have enjoyed working with the company since beginning and wish to continue with my services but unfortunately, my stomach ulcer has gone into a worse condition where the doctors have suggested a minor surgery which I would like to do in my home country. Hence, please consider this letter as official resignation letter from my services starting from tomorrow ____________. My last working day with the company will be ___________. Please process my resignation further and ensure to release my EOB before I leave the company on the above said date. I would like to this opportunity to thank all of you for supporting me during my career with the company as I have learnt a lot during my service. I am writing this letter to inform you that I am hereby resigning from Howard Spencer for personal reasons. Throughout my years of working as an associate, I have had a wonderful experience and I have learned a great deal. My fellow employees have always treated me with the utmost respect and care. Howard Spencer has felt like my home; I will miss everyone very much. I hope that you will respect my decision and I wish you all best of luck. 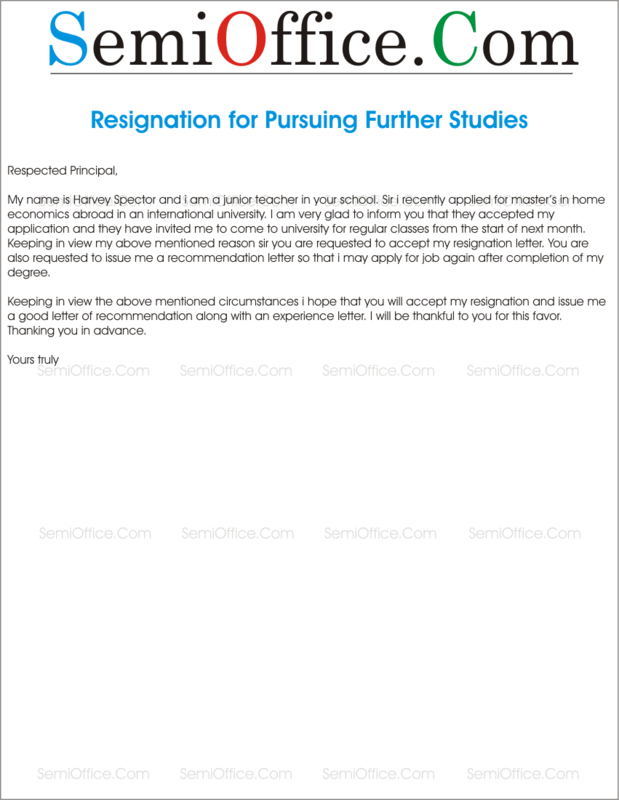 Sample resign letter for teaching position in school, college, academy, University or as personal tutors. Best resign letter by teacher to submit to headmaster, principal or in school. I’m pleased to inform you that I’ve been offered a job as the Head of Statistics Department at Forman Christian College, Lahore. Working at APWA College has boosted my confidence and polished my professional skills. However, one must keep progressing and excel in their career life. The job starts from 1st August 20XX, therefore, I request you to kindly accept my resignation without the completion of notice period so I can take this job. I’ll be much obliged to you. I am Sonia Sanam teaching at your prestigious institute since four years to O/A Levels, Intermediate and Graduation classes. It was really a tremendous teaching experience for me as a student of university. Now I got admission in MSc GIS two years program at Kingston University and my classes will start from first week of November. I wanted to inform that this will be my last week of teaching in your institute. Please submit and acknowledge my resignation to the concerned staff so they would arrange a new teacher as replacement on urgent basis and issue me a clearance/experience letter to submit in university. Most respectfully I beg to say that I have been working as a regular teacher in your college. I have left no stone unturned in brightening the name of your institute. Now I want to inform you that I have got govt job in Higher Secondary School Saman Abad Faisalabad as a science teacher at 16 scale. I want to resign from your Institute so that I may join my duty in school as a SSE. I shall be thankful to you for this favor. Hoping your cooperation and thanking you. I’ Ayesha Naeem teacher of English Language at your institute is submitting my resignation due to my marriage. My marriage ceremony is in next week and my In Laws lives in London. I will go to London with my husband after the marriage so It will not be possible for me to continue this teaching job. This job was an amazing experience and help me to groom my personality, presentation and interpersonal skills. I request you to please clear my due payments from salary and security as early as possible and issue my experience certificate. I will be thankful to you. I am Abeera teacher for prep section in your prestigious institute since 2 years. I am facing some health issues and my doctor suggest me to have rest until recovery. Doctor gave me medicine for 3 months and now I cant continue my job as teacher. Please accept my resignation for approval. This letter is to resign from teaching. I have recently been offered to serve as a trainer in a teacher trainer institute to which I have approved and assented. Therefore, I resign from teaching in your institute. I had a very good time in your institute. I enjoyed having such great teachers and trainers as my colleagues. I have no grievances with any staff member or faculty. I wish that the institute would flourish and gain much reputation in future. I was wrong about the reputation and atmosphere of your institute. I had never faced such hardships in teaching at any other institute. Till now I know that I was at the right side of the argument. Respect of teachers should be first taught to persons like you and your admin staff. Many teachers have agreed to my point of view. I assume and hope that other teachers would also resign in near future and you would be left alone with your own supporters who are nothing but a bunch of idiots. I am Professor Marsh and with all due respect it is stated that I resigned from your university on 21st of September. Now I want to get a job in some other university but they are asking me to attach a copy of the resignation letter with the stamp of the chancellor on it. I would be very thankful to you if you could spare some of your precious time and send me a copy of that letter with your stamp on it. It will help me joining the job as early as possible.